Don Tudor | Galion Inquirer Kaden Ronk took a few snaps as quarterback for the Crestline Bulldogs on Saturday as they shutout the visiting St. John Fighting Herald; 52-0. In the victory, the ‘Dogs posted over 550 yards of total offense to improve to 3-4 on the season. CRESTLINE — On Saturday afternoon, the Crestline Bulldogs welcomed the Ashtabula St. John Fighting Herald to Hutson Stadium to compete in week seven football action. The game served as the annual Military Appreciation game for the ‘Dogs, with veterans being honored for their service to our country. The battle on the gridiron proved to go Crestline’s way as they posted 569 yards of total offense (203 passing, 366 rushing) in the process of shutting out their visitors; 52-0. With the win, the Bulldogs improve to 3-4 on the 2018 season. Crestline’s offensive onslaught begin early as quarterback Ty Clark found wideout Jaxson France for a 12-yard touchdown to put the ‘Dogs up early; 6-0. Clark would post the second touchdown of the opening frame on a 30-yard keeper. The Bulldogs would proceed to convert the two-point attempt and, after the first 12 minutes of play, take a 14-0 lead. In the second quarter, Caleb Moore added to the home team’s advantage on a 38-yard rushing TD to put Crestline up; 20-0. Clark dashed in for his second rushing touchdown of the game, this time from six yards out, to make the score 26-0 in favor of the blue and white. The Bulldogs would strike once more before the conclusion of the first half as Ethan Clum punched in a seven-yard rushing TD. Logan Parrella added the extra-point and at the half it was all Bulldogs; 33-0. The home team proved that they were far from finished scoring as Moore dashed in another score, this time from 51 yards and with the Parrella PAT, it was 40-0. Clark would find Kaden Ronk for a five-yard aerial touchdown to bring the score to 46-0 at the conclusion of the third period. Clum joined the two-touchdown club in the fourth as he ran into the endzone from 17 yards out to give Crestline the lead by the eventual final score of 52-0. On the day, Clark completed 12 of 22 passes for 200 yards while tallying two touchdowns and one interception. Clark also posted 49 rushing yards on five carries, good for two touchdowns. Moore led the ground attack for the Bulldogs, racking up 204 yards on just nine carries en route to the two scores. Clum would also finish with more than 100 yards, netting 106 yards on 13 carries and two rushing touchdowns. France was Clark’s primary target on the afternoon, catching four passes for 82 yards, including the touchdown to start the game’s scoring. Dakota Wireman finished with three catches for 63 yards and Calvin Reed caught two passes for 42 yards. Ronk scored a touchdown and wrapped the game with three catches resulting in 14 yards. 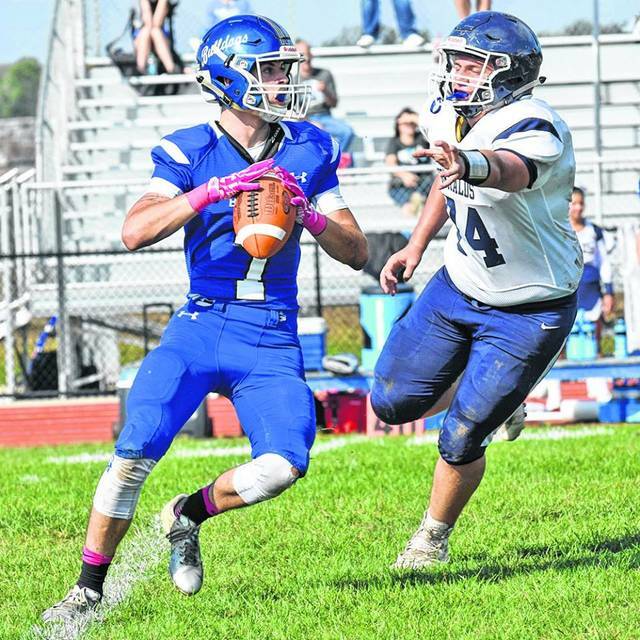 Crestline will be at home in week eight action as they welcome the River Pilots to Hutson Stadium on Friday, October 12.
https://www.galioninquirer.com/wp-content/uploads/sites/38/2018/10/web1_Kaden-Ronk.jpgDon Tudor | Galion Inquirer Kaden Ronk took a few snaps as quarterback for the Crestline Bulldogs on Saturday as they shutout the visiting St. John Fighting Herald; 52-0. In the victory, the ‘Dogs posted over 550 yards of total offense to improve to 3-4 on the season.